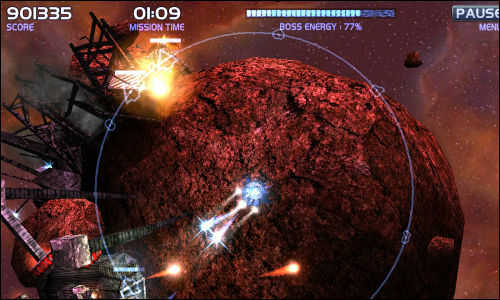 In DarkSide, players take on the role of a pilot hopping from one colony to another while attempting to complete a variety of mission objectives. Use the left mouse button to shoot, and hold the right mouse button to jet around the landscape. Tap the middle mouse button to activate your smart bomb. Keep an eye on the radar as it can prove to be extremely useful when trying to figure out an enemy's position. DarkSide is developed by George, the one man development team behind Pi Eye Games.